I was lucky to meet three celebrities in the past few months so this is going to be part 1/3 "photos with celebrities" posts, the rest will come in the following weeks. 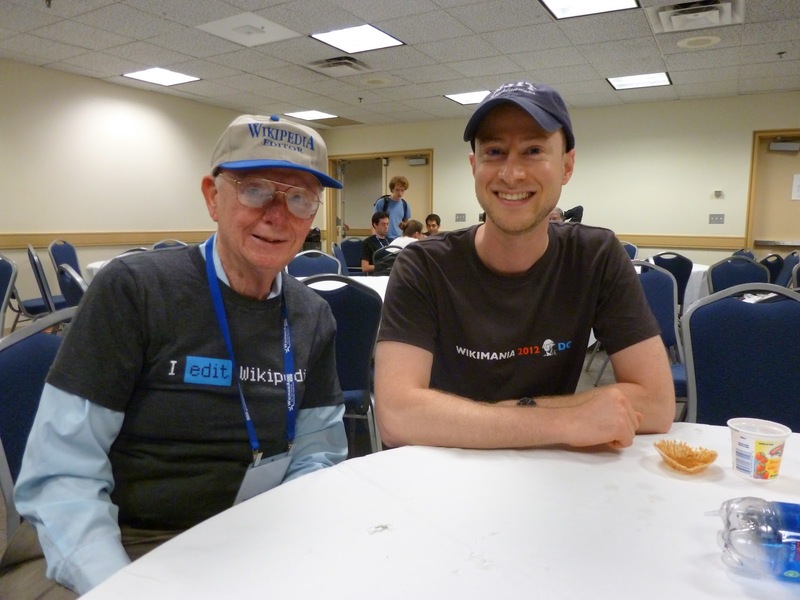 The man you are looking at above (on the left) has over 80,000 edits on wikipedia. You can see that from his user page here. This makes him ranked number 281 in the world for that metric which you can see on this list of wikipedians by number of edits. Of course edit count is not necessarily a good way to measure a person's contribution... especially if you have the "Obsessive edit-counting disorder". At Wikimania Dthomsen8 he led a great session on the "article rescue squadron," a group he is very active in. They are volunteers dedicated to saving articles that were nominated for deletion by adding references or arguing for their notability. Their greatest frienemy are the grumpy admins of the New Page Patrol. Another interesting user has been hard at work since 2007 with 33948 edits (as of 8-5-2012) that almost all are fixing incorrect uses of "comprised of" which you can see from his list of edits here. He also has a nice description of the problem that I didn't even know existed.